The editors of The Friend Who Got Away are back with a new anthology that will do for money what they did for women’s friendships. Ours is a culture of confession, yet money remains a distinctly taboo subject for most Americans. In this riveting anthology, a host of celebrated writers explore the complicated role money has played in their lives, whether they’re hiding from creditors or hiding a trust fund. This collection will touch a nerve with anyone who’s ever been afraid to reveal their bank balance. 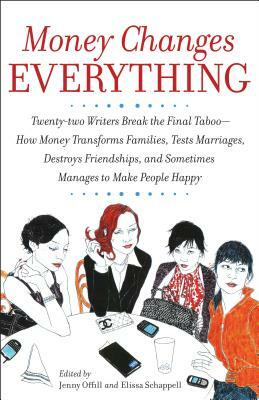 In these wide-ranging personal essays, Daniel Handler, Walter Kirn, Jill McCorkle, Meera Nair, Henry Alford, Susan Choi, and other acclaimed authors write with startling candor about how money has strengthened or undermined their closest relationships. Isabel Rose talks about the trials and tribulations of dating as an heiress. Tony Serra explains what led him to take a forty-year vow of poverty. September 11 widow Marian Fontana illuminates the heartbreak and moral complexities of victim compensation. Jonathan Dee reveals the debt that nearly did him in. And in paired essays, Fred Leebron and his wife Katherine Rhett discuss the way fights over money have shaken their marriage to the core again and again. We talk openly about our romantic disasters and family dramas, our problems at work and our battles with addiction. But when it comes to what is or is not in our wallets, we remain determinedly mum. Until now, that is. Money Changes Everything is the first anthology of its kind—an unflinching and on-the-record collection of essays filled with entertaining and enlightening insights into why we spend, save, and steal. The pieces in Money Changes Everything range from the comic to the harrowing, yet they all reveal the complex, emotionally charged role money plays in our lives by shattering the wall of silence that has long surrounded this topic. ELISSA SCHAPPELL is the author of the Use Me, a contributing editor to Vanity Fair, and a cofounder of Tin House. JENNY OFFILL is the author of Last Things and teaches in the MFA programs at Brooklyn College and Queens University. They are the coeditors of the anthology The Friend Who Got Away. Tales of failed marriages, substance abuse and family dysfunction are talk show staples in America. Given this culture of confession, why is talking about money still such a taboo? The American Dream promises that anyone who works hard enough can have a rags to riches success story. Do you think this is true? Is the American Dream still an achievable ideal? What does it mean to be middle–class in America? How has this definition changed over the years? Economists note that middle–class Americans are now carrying record levels of credit card debt. What do you think leads people to take on more financial liability than they can handle? Do you see debt as the sort of misfortune that could happen to anyone or as a weakness of character? Discuss common generalizations about "the poor" and "the rich" in our society. Are these assumptions based on emotion or fact? In "My Inheritance", Meera Nair explores the tangled history of how money and land have been passed down through three generations. Have the terms of an inheritance ever caused a rift in your own family? In "The American Dream", Isabel Rose describes the difficulties of dating as a wealthy heiress. Men who had less money than she did often felt defensive about being "kept" while men who came from the same sort of background disliked that they couldn't impress her with their lavish gifts. Have you ever been involved in a romance that faltered because of a disparity in finances? In "Nouveau Poor", Ruth Konigsburg writes about passing as rich when in fact her family was barely paying the bills. Claire Dederer writes about the opposite situation: keeping mum about her secret "stash" so as not to seem like a trust fund dilettante. Have you ever felt the need to misrepresent your financial status? If so, why? In "The Perilous Dune", Jay McCulloch reminisces about her charmed childhood growing up on Park Avenue, and yet she was embarrassed enough about her address to hedge about where she lived. Are such lies necessary? Will wealthy people who admit their good fortune find themselves taken advantage of? In this same piece, McCullough writes about coming to terms with the realization that she cannot offer her children the same level of comfort and security her family provided her. Do you think hers is a common experience in this day and age? Financial difficulties are the number one cause of divorce in America. In Fred Leebron and Katherine Rhett's paired essays, the couple describes how their own differing attitudes towards money have shaken their marriage over the years. What role has money played in your own intimate relationships? Why is the vow "for richer or poorer" so hard to keep? As we see in both Charles D'Ambrosio's and Jonathan Dee's essays, our parents' relationship to money greatly informs our own. In what ways did your family's attitudes about money influence you? In what ways have you broken away from their values?